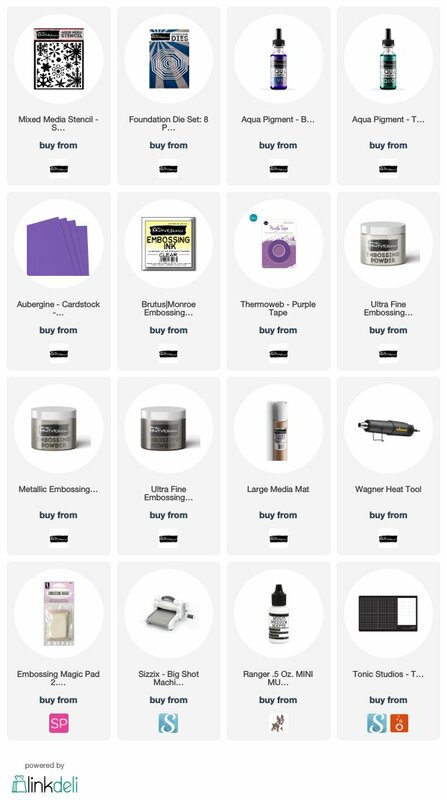 Glowing Your Way Through Halloween PLUS a Giveaway! 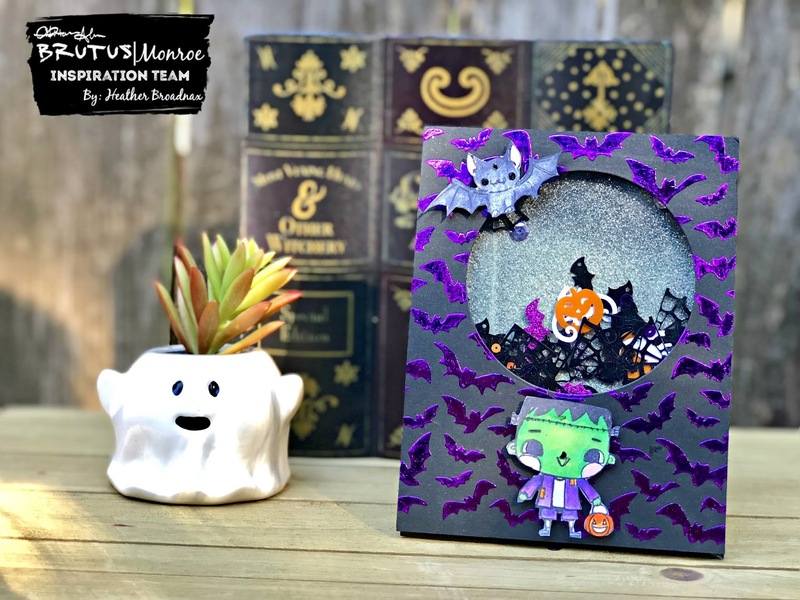 Today we are all about Fall and Halloween for our Wednesday Blog Hop. 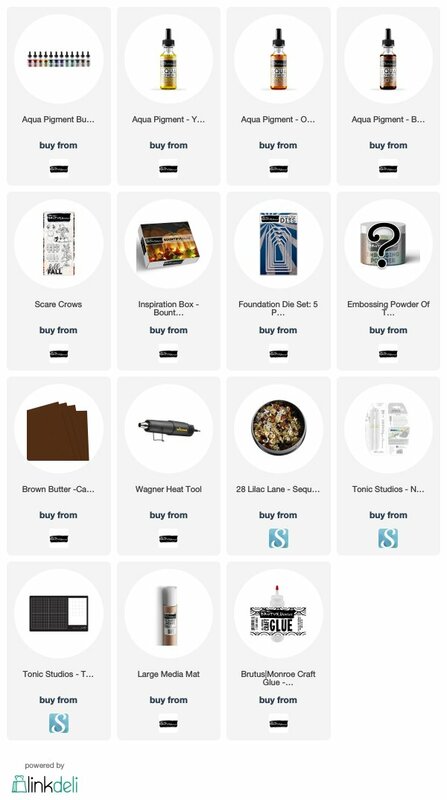 In addition to the amazing projects that our team has created for you this week we also have a ***GIVEAWAY! 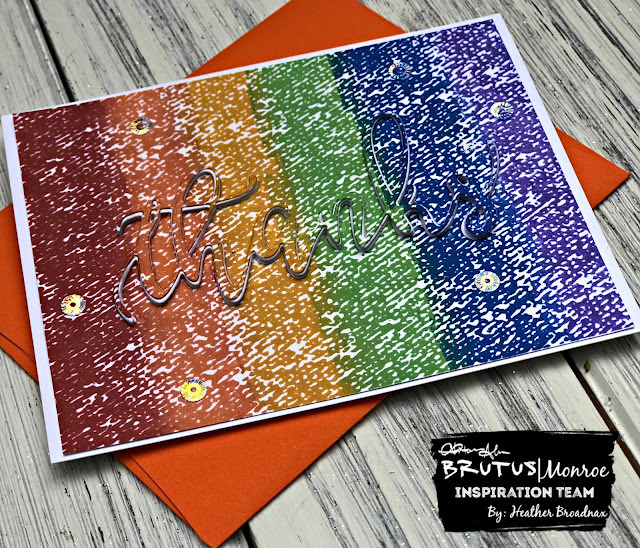 *** We wanted to have a little fun with our blog hop this week, and give away ONE 25.00 GIFT CERTIFICATE to the Brutus Monroe store! 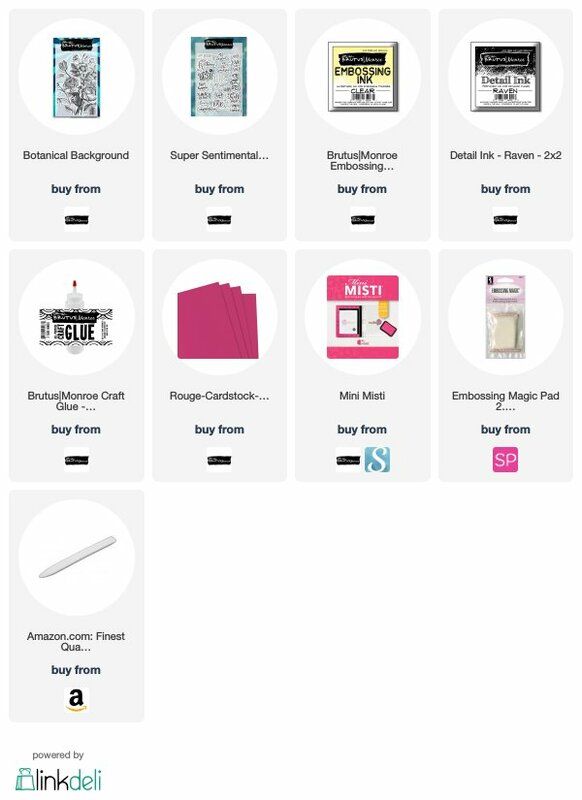 Just leave a comment on each blog post along the hop to be entered! Winner will be announced on next Wednesday's blog hop post, November 7th, on the Brutus Monroe blog. Please remember to check back next week to see if you are the winner! 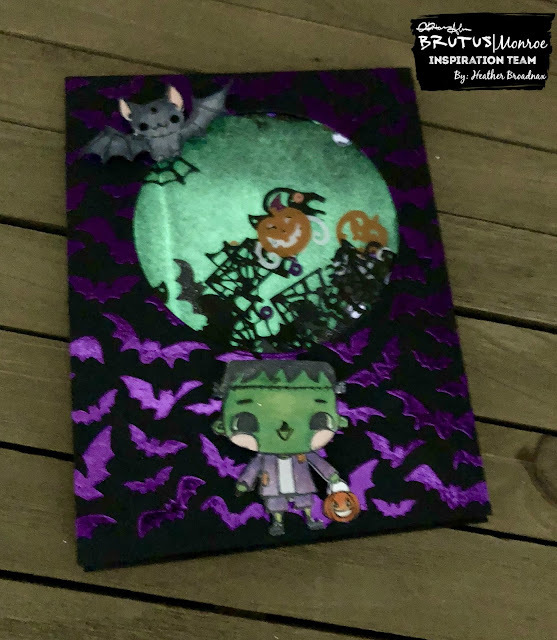 For this weeks card, I wanted to create a fun interactive glow in the dark Halloween card using the All Hallows Eve stamp set along with foiling, Aqua Pigments and the star of the show Glow in the Dark Glitter Glaze. 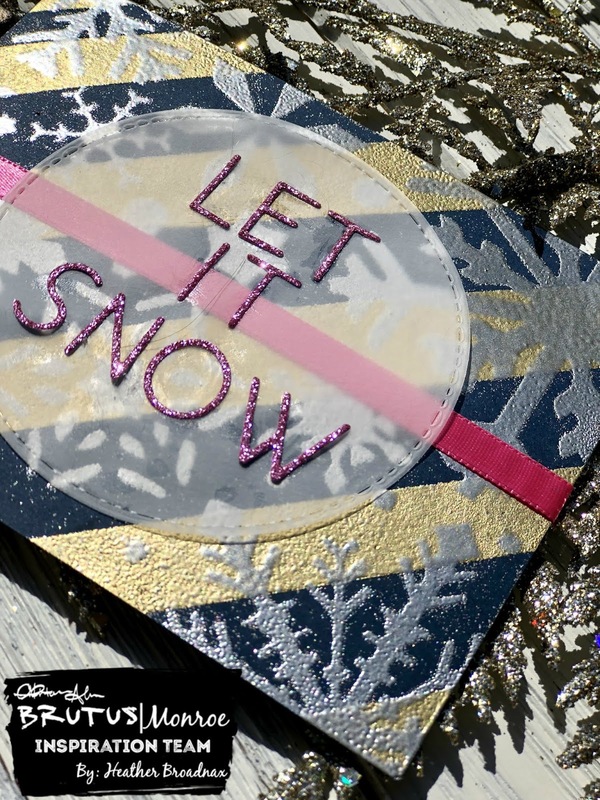 To begin I added deco foil transfer gel to a piece of Raven cardstock using Newton Nooks Flying Bat stencil. Once it had dried I added purple deco foil and cut a circle in the middle using Circle Foundation Dies. along with a larger circle from clear acetate. To create the shaker element I covered a panel of Raven cardstock with Glow in the Dark Glitter Glaze. This glaze has an amazing glow!! I have to store it in a drawer because it will glow in the middle of the night on my desk. Once the glaze had dried I added Spooky Night sequin mix for the shaker bits. I LOVE this mix. There are large pumpkins and spider webs along with smaller elements that worked well with the Glow in the Dark Glitter Glaze. Two sheets of fun foam were used to create the dimensions for the large shaker pieces to move. Once it was adhered to the panel the only thing left was to watercolor the fun characters from All Hallows Eve stamp set. I used Aqua Pigments to watercolor the Frankenstein boy and bat from the stamp set. Once they had dried, I fussy cut them they were adhered using foam squares to the panel under the shaker element and at the top. Check out all of the great projects from our team this week below. Don't forget to leave a comment to be entered to win a 25.00 gift card from Brutus Monroe. Announced on November 7, 2018. Hello! As the last leaves fall from the trees the empty branches will soon be draped with beautiful blankets of snow. 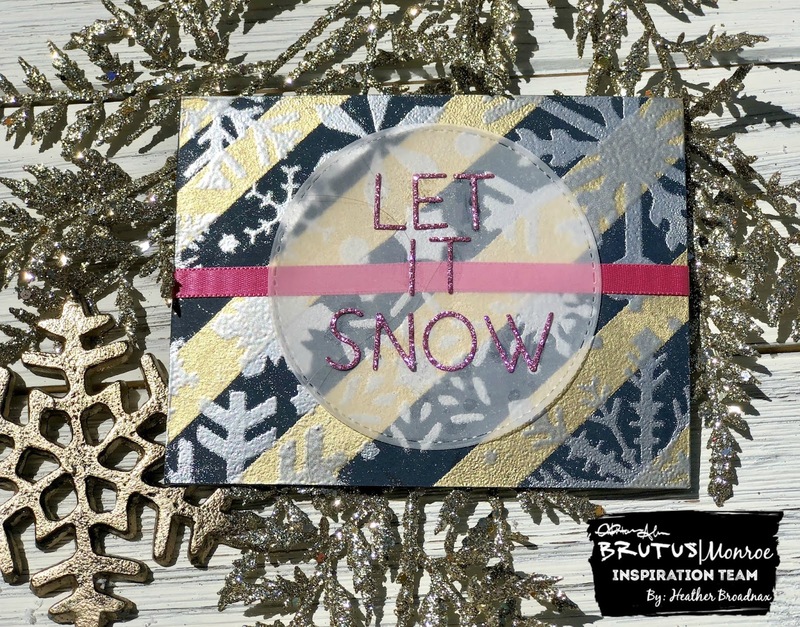 Today we have a card for you that shows the beauty of snow in purples and blues using heat embossing, die cutting and aqua pigments. 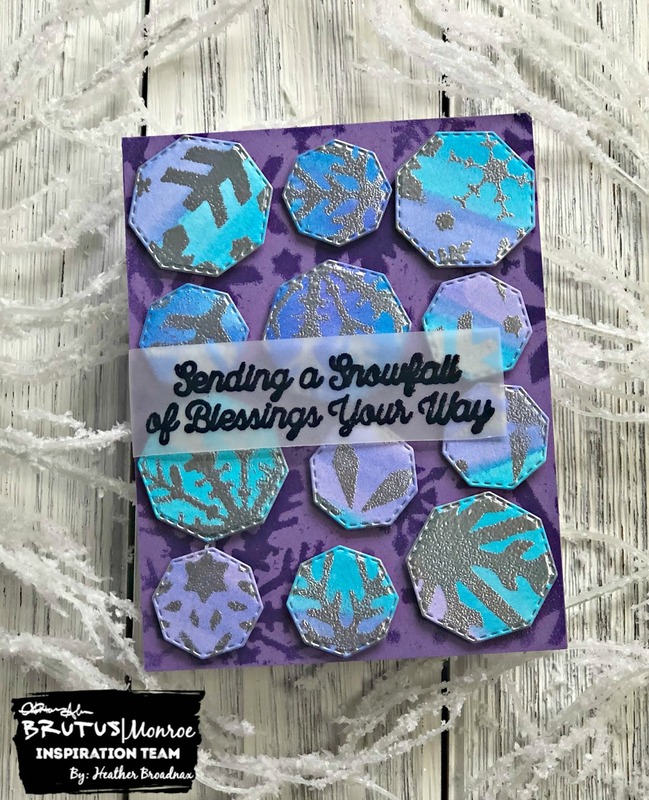 To create the back panel of the card, I taped down the Snowflake stencil using purple tape onto a piece of Aubergine cardstock. Once it was secure, clear embossing ink was added directly from pad to paper until the open areas in the stencil were coated. For this panel I added Icicle embossing powder and heat set it to create a great tone on tone look with a little shine. Next, I created the panels that were used to cut the hexagon shapes. The panel was used by adding generous amounts of water to a piece of watercolor paper and then dropping blue violet and turquoise Aqua Pigments onto the paper and moving them around until I got the desired look. 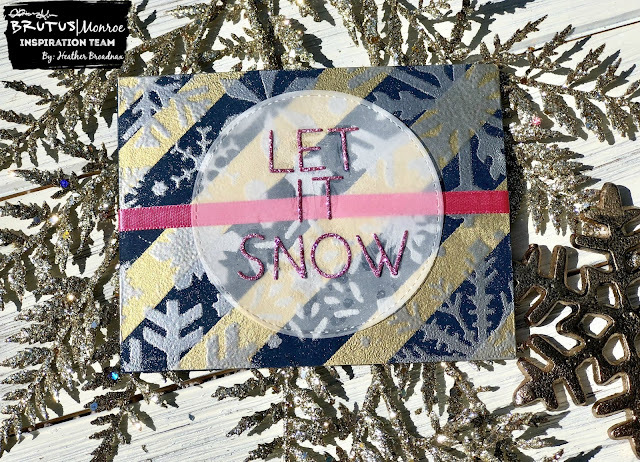 Once it had dried, the same technique using the snowflake stencil that was used for the base on the aqua pigment panel except this time it was coated in Sterling embossing powder. I love the gorgeous silver and shine that you get from the Sterling embossing powder. After the panel was embossed, I used the two smallest dies from the Hexagon Foundation set to cut the mail focal point of the card. They were randomly placed on the Aubergine panel and then adhered with foam squares to give them dimension. Finally, the sentiment was added using Raven embossing powder on vellum and positioned on the left side of the card. This is a fun way to use backgrounds that you may have created and been holding on to for the perfect time to use them. 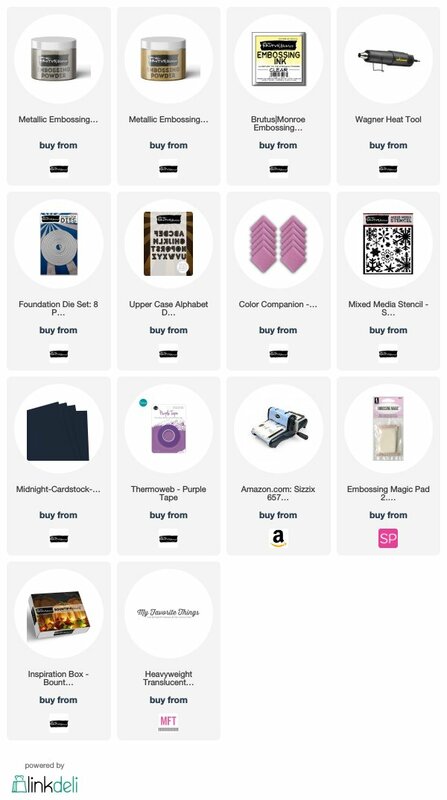 Take a look at your dies and see how you can use them with the panels to create something unique. Hello! Today the Brutus Monroe Inspiration Team is all about Florals. 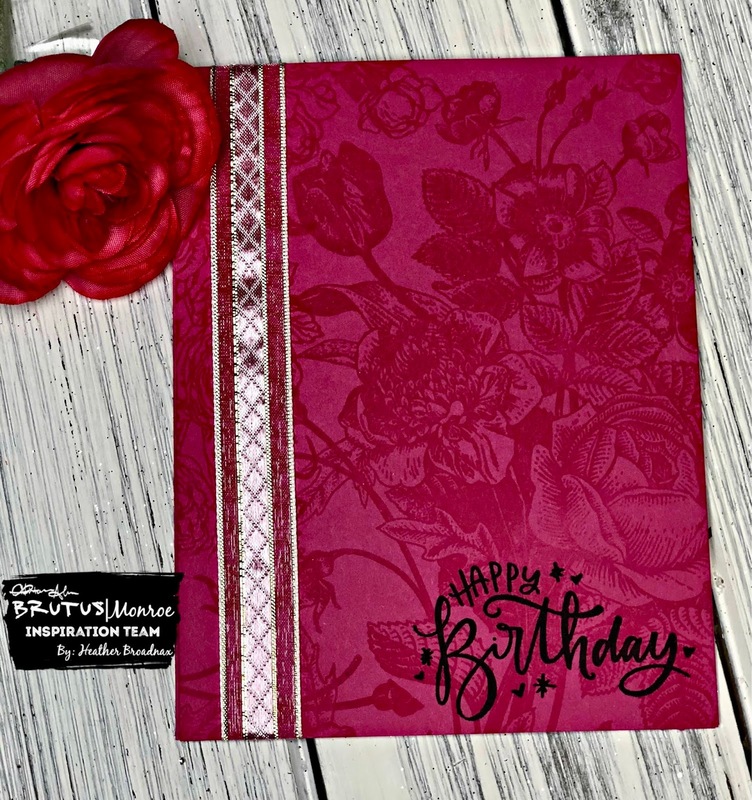 Brutus Monroe has many beautiful floral stamps available to purchase for any occasion card that you may need. Today I am showing you a simple card using the Botanical Background stamp. 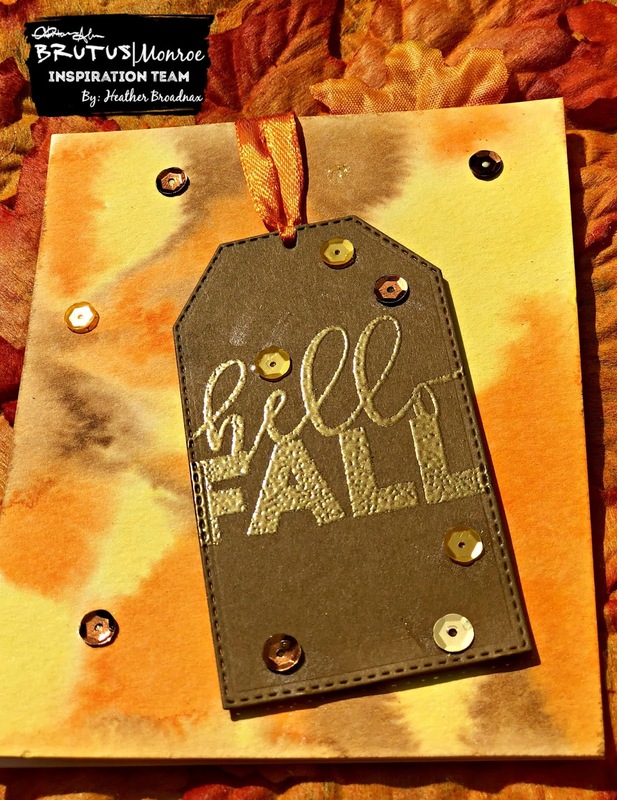 First, I stamped the background using clear embossing ink on a piece of rogue cardstock. 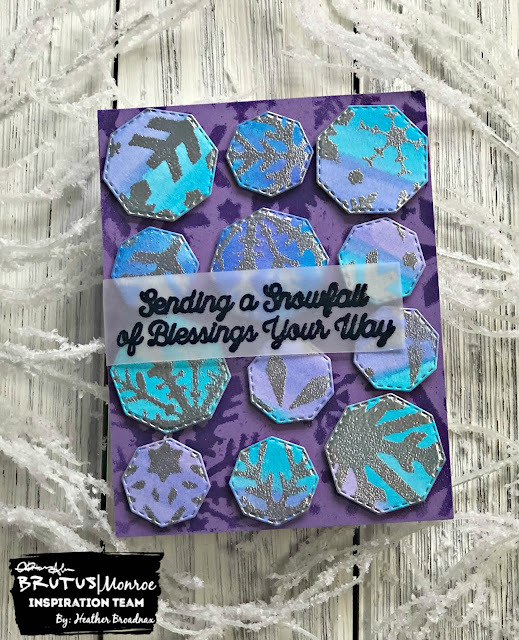 I originally intended to heat emboss the florals with alabaster embossing powder, however once I had stamped it out I realized that I loved the watermark look and decided not to emboss. I love when the products take you in a direction you didn't intend, but love the results better than what you had planned. 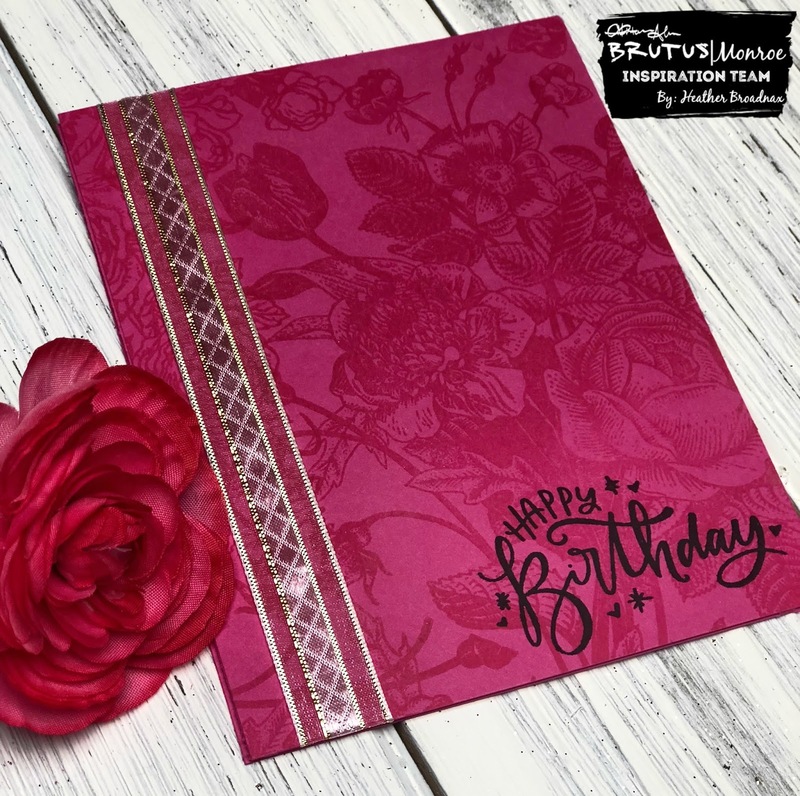 Once the clear embossing ink had dried I added a piece of ribbon from a previous inspiration box down the side and stamped out the "Happy Birthday" sentiment from Super Sentimental in Raven Detail Ink on the bottom of the card. I wanted the florals to be the main focal point. This card was so simple and would be so easy to make in bulk. 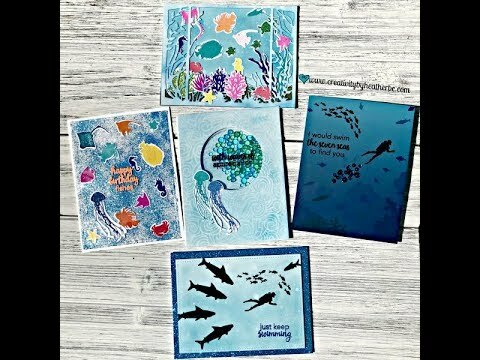 You could stamp out several of these very quickly adding different sentiments and using multiple colors of cardstock for variety. For more floral fabulous inspiration check out the rest of the Inspiration Teams projects below. 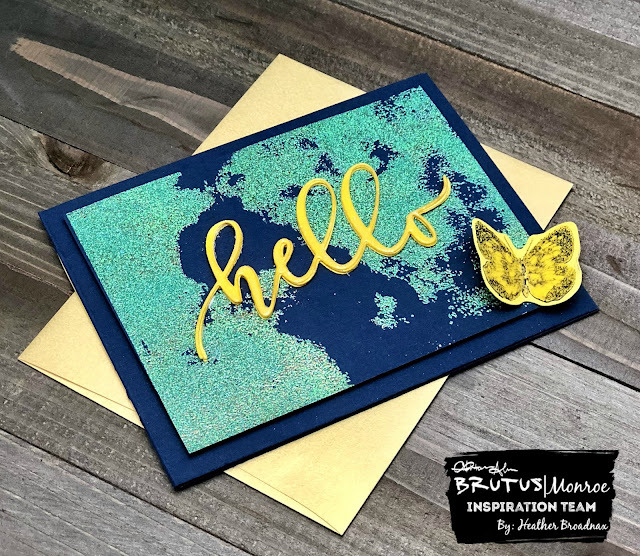 Today I am showing you a card created using the Dance with Denim Brutus Monroe and Unity background stamp along with the Thanks die. I used a die cut inlay technique to create a continuous background and sentiment. 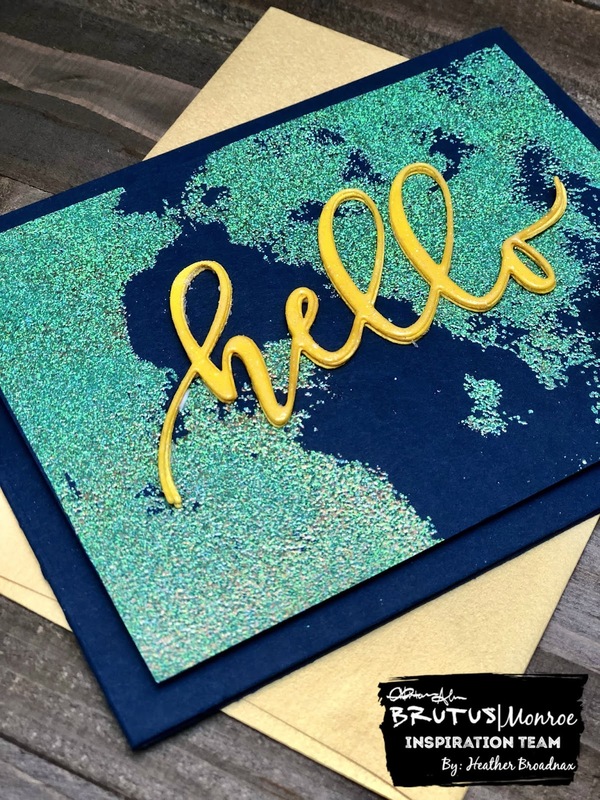 This technique was a lot of fun and can be used in many different ways with numerous backgrounds and die cuts. Let's get started! 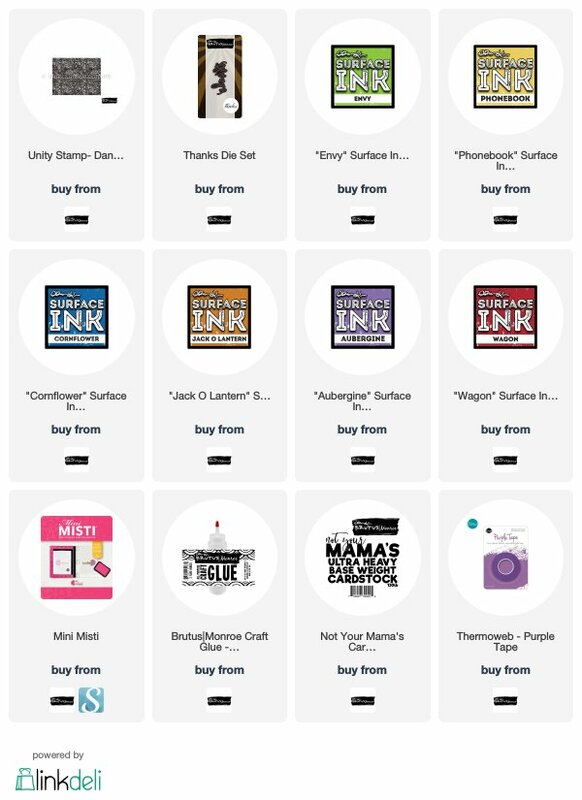 First, I inked up the background stamp with Wagon, Jack-O-Lantern, Phonebook, Envy, Cornflower and Aubergine surface inks in a rainbow pattern vertically down the stamp. Using a Misti I stamped the background on an A2 size panel. One of my favorite things about these background stamps is the size. They are the perfect size for an A2 panel. Next, I taped the Thanks die. in the center of the inked panel with purple tape and ran it through my die cut machine. To give the sentiment a small amount of dimension I also cut it three times from Not Your Mama's white cardstock. After I adhered the panel to my card base I glued the Thanks die cuts together and then adhered it to the panel. It should fit in like a puzzle piece. Make sure you save all of the inside parts of the die to add back in as well. To complete the card I added bottle cap sequence Glass Slipper. Thanks it! 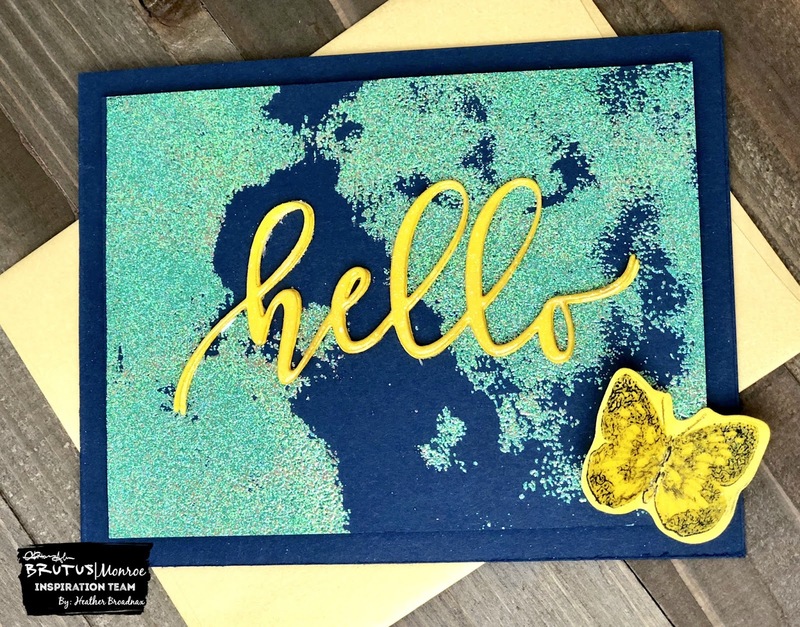 So simple and there are so many ways that you can do the same technique with many different stamps. There are also now 4 new Christmas Collaboration stamps with Unity available. This technique would make great holiday cards. Check them out here. we are showing you projects created using Aqua Pigments. The Brutus|Monroe Aqua Pigments are specially formulated watercolors that work beautiful on all types of mediums. It is suggested to use them straight out of the bottle but they can have water added to them to lighten any color within the range. I am showing you how adding a few drops of household bleach to your clean water can give your backgrounds a awesome effect that you can't get with regular water. The dropper bottle makes this technique so easy! 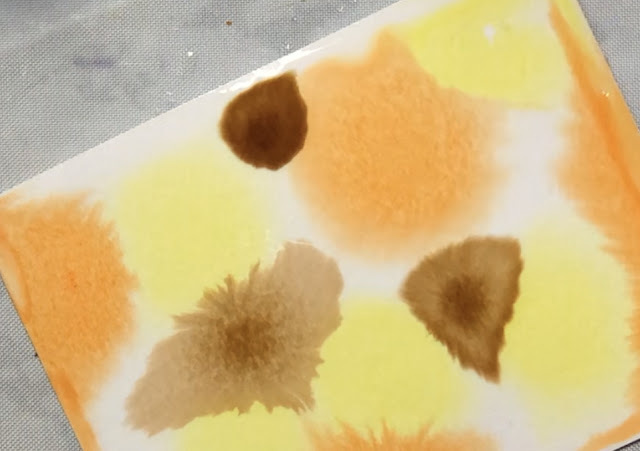 After I added the bleach to the water I used a large paint brush and generously added the water to a panel of watercolor paper. Make sure that the paper is completely wet or the technique will not work in all area's. I used yellow first, dropping it in random places on the panel. When you drop the pigments they spread out, but have a darker "eye" in the center that will fade out. After the yellow, I dropped orange, then brown and went back with each color to fill in spaces until I had the panel completely covered with color. 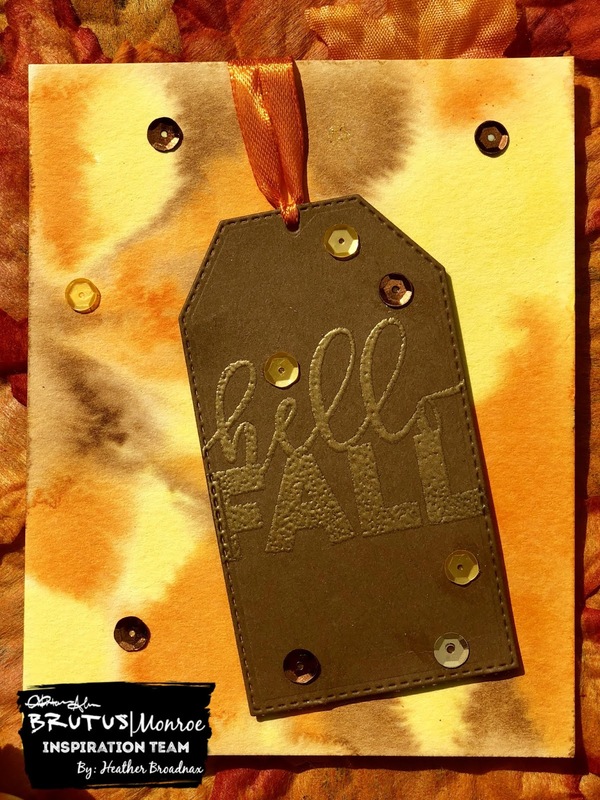 Next, I cut a tag from Brown Butter cardstock using the Foundation tag dies to add my sentiment. 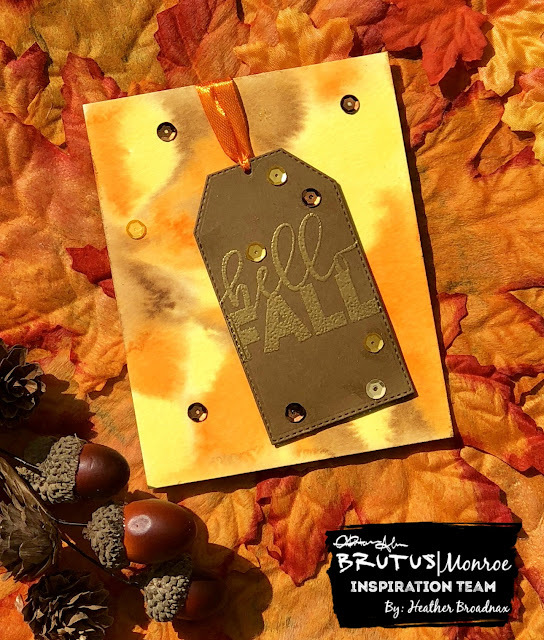 The sentiment is heat embossed with the October Embossing Powder of the Month Club Golden Gourd. To add interest to the tag I added a piece of orange ribbon from the October Inspiration Box and sequence from Lilac Lane. 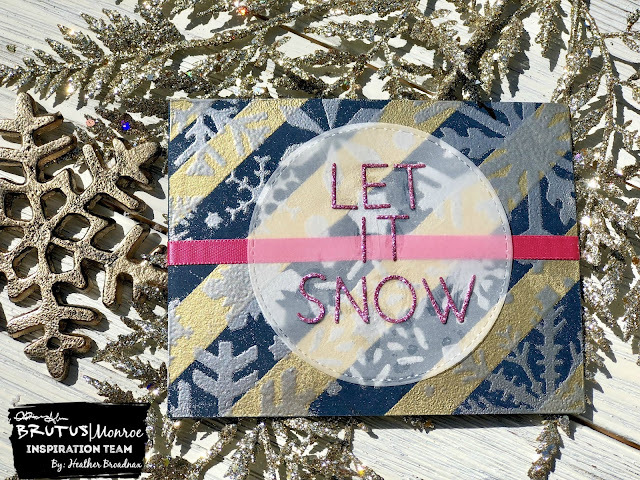 Once the tag was attached that completed this simple, fun card. 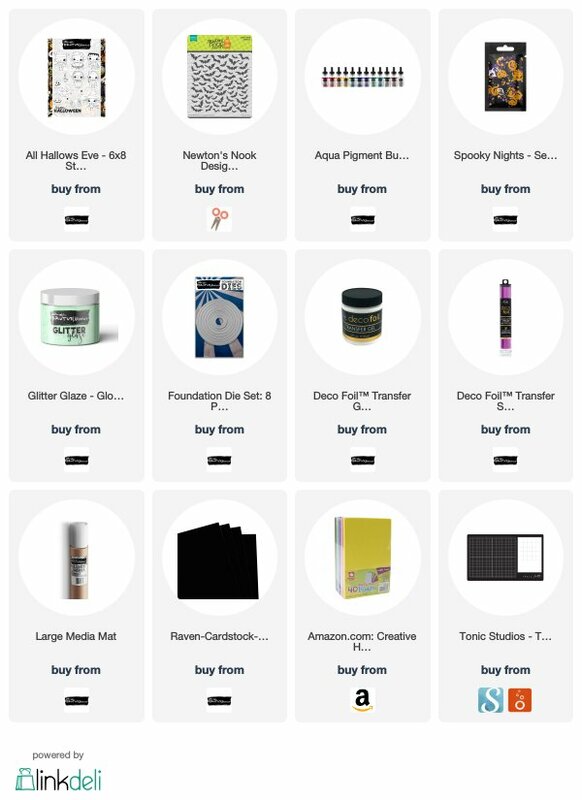 Check out the fantastic projects from the rest of our design team below. We have officially entered October. Fall leaves, spider webs, pumpkins, bats and candy corn vampires Wait, CANDY CORN VAMPIRES?! Yep! Brutus Monroe has combined two favorites of Halloween into one adorable stamp! 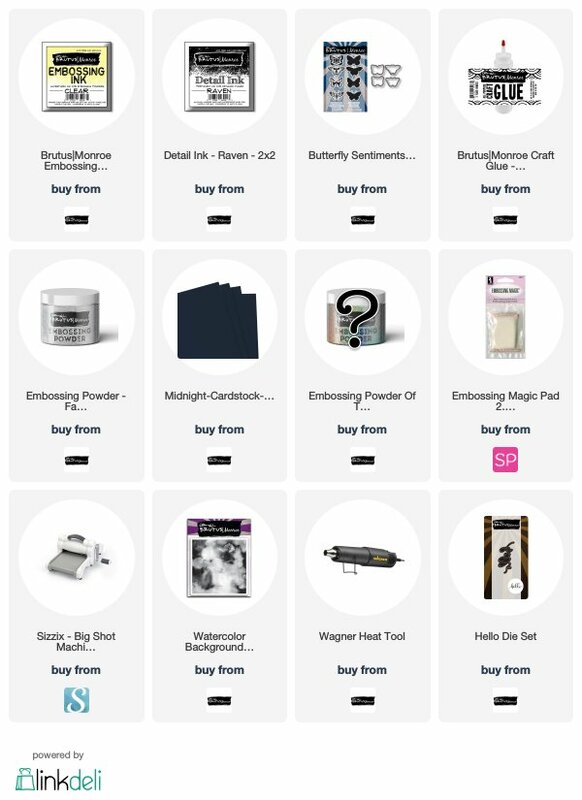 How do you get yours?? For the card design I wanted to combine the monthly stamp set with the newly released Pumpkin Faces stamp set. For the background I blended aubergine , midnight, and cornflower surface inks. I wanted the background to have more of a blue tint to make the candy corn bats and candy corn vampire stand out. There was a lot of masking paper used to create the candy corn bats and to bunch up the pumpkins in the corner. I used Raven detail ink to stamp the vampire candy corn stamp so I could do copic coloring without fear of the ink bleeding into the coloring. 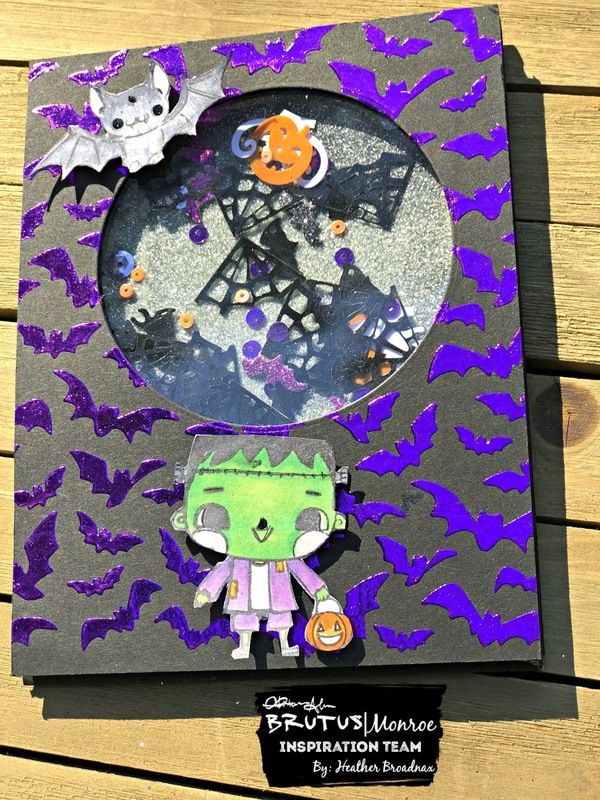 I used Raven embossing powder on the bats wings and the pumpkins faces. 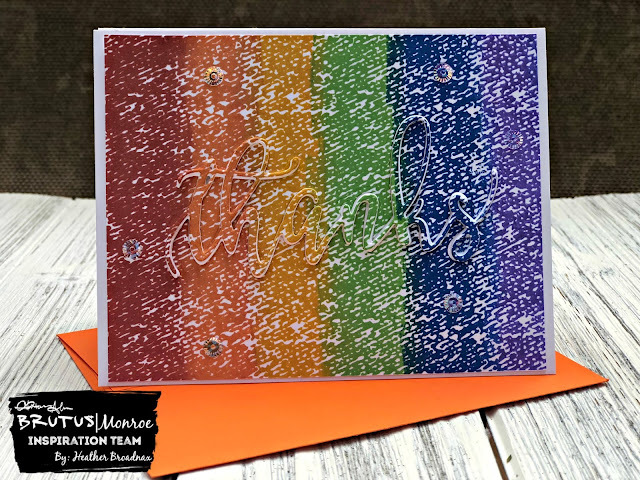 The adorable "Bite Me" sentiment that comes with the set was added by heat embossing Twisted Tangerine on raven card stock. The candy corn vampire was attached with foam tape to give it dimension from the smaller candy corn bats. I hope you enjoyed this adorable Candy Corn Vampire scene using the new October Stamp Monthly Stamp Club stamp. Don't forget to subscribe to get yours today! Check out the rest of the amazing designs created by our inspiration team below.